Georgia’s Environmental Protection Division (EPD) in June fined Gold Creek Foods in Dawsonville $9,000 for a March spill of ferric chloride that resulted in a complete kill of aquatic life along a 3.7 mile stretch of Flat Creek. 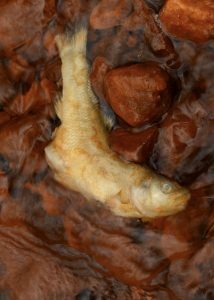 According to EPD documents, the spill killed an estimated 8,262 fish, including federally threatened Cherokee darters. In addition to the $9000 fine, EPD is requiring the company to clean up soil at the facility contaminated by ferric chloride, improve its stormwater pollution prevention plans and fund a $6000 study of Flat Creek to determine what aquatic wildlife is returning to the creek and at what rate. CLICK HERE TO READ THE FULL TEXT OF EPD’S ACTION AGAINST GOLD CREEK FOODS. One of more than 8,000 fish that died in Dawson County’s Flat Creek following a chemical spill at Gold Creek Foods, a chicken processing facility in Dawsonville. The spill was caused on March 20 when a 55-gallon drum of ferric chloride was accidentally punctured in an area where Gold Creek Foods did not have adequate containment facilities to prevent the pollutant from reaching the creek. Gold Creek Foods took measures to control the spill, but failed to report the release of the pollutant until March 22 when City of Dawsonville workers noticed dead fish in the creek and tracked the problem to the Gold Creek Foods facility. In addition to failing to report the spill to authorities, EPD cited Gold Creek Foods’ for multiple violations of the facility’s Industrial Stormwater Permit, including an inadequate spill prevention and response plan and a failure to provide emergency containment of materials. 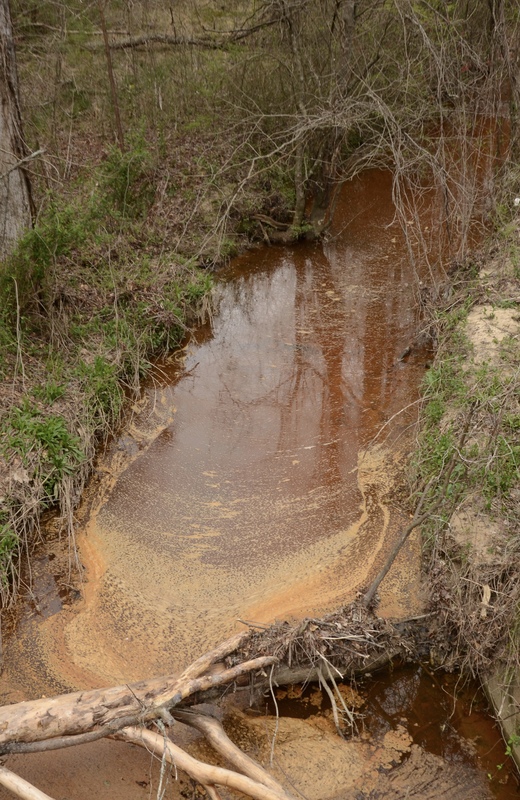 State law allows EPD to fine polluters up to $50,000 per day for violations of clean water laws, meaning that this fine could have exceeded $100,000 for the several days in which ferric chloride leaked into Flat Creek. Georgia’s Industrial Stormwater permit program has been perpetually plagued by understaffing. There are more than 2,000 Industrial Stormwater permits in Georgia, but EPD has only two staff members assigned to reviewing Stormwater Pollution Prevention Plans (SWPPP) and inspecting sites to ensure compliance with the permits. EPD had not inspected the Gold Creek Foods facility in at least 5 years, and the EPD staff never fully reviewed the SWPPP for the facility. CRBI’s investigation of the Gold Creek Foods stormwater monitoring reports showed that discharges from the company’s stormwater pipes into Flat Creek regularly exceeded clean water limits. The U.S. Fish & Wildlife Service (USFWS) may take additional action against Gold Creek Foods for the loss of federally threatened Cherokee darters in the creek. CRBI will urge USFWS to take action and is currently determining next steps in securing greater mitigation for this catastrophic fish kill.